A little bit Scrabble, Letterpress, and Tetris, the Word-A-Fall iPhone and iPod Touch game app challenges you to form words from letter tiles cascading down the screen. The pleasant graphics and simple interface are deceptive, as this is a surprisingly tough game complete with power-ups and obstacles. The Word-A-Fall iPhone app has a nice graphic of a waterfall where the letter tiles fall from the top of the screen to the bottom of the screen. The timer is set to two minutes. You create as many words as possible by touching the letters in an order that forms a word. Each letter fills in the field at the bottom of the screen. You swipe to the right on the word to submit it, and the points listed on the tile for each letter are tallied. You swipe to the left to clear the field to start a new word. The game play of the Word-A-Fall iPhone app is not as simple as the gestures. The screen is constantly changing, and new letters are constantly added. You must immediately process the letters on the screen and start to form a word. More letters are falling, and you will want to reevaluate your strategy. Do you hold out to get some additional letters to form a longer word and get more points? Do you just try to form as many small words as possible? With the speed of the letters falling, you may start tapping and get the order wrong. You cannot reorder the letters of a word. You must swipe to the left to clear the existing letters and start over. The fast pace makes it dynamic, and your mind must work to organize letters quickly. 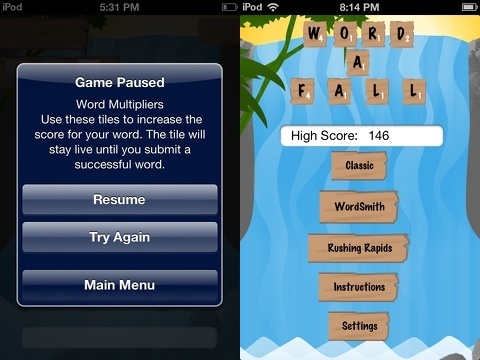 The Word-A-Fall iPhone app incorporates different play modes, power-ups, and obstacles to enhance the game experience. There are two additional play modes, but the gestures and goal to earn points remain the same as the previously described classic mode. The WordSmith mode requires every word to have a minimum of four letters. The Rushing Rapids mode speeds up the pace of falling letters after every successful completion of a word. There are eight action tiles to amplify the game play with five tiles helping you to earn more points and three tiles creating obstacles. The tiles to add time and multiply word scores are particularly helpful. 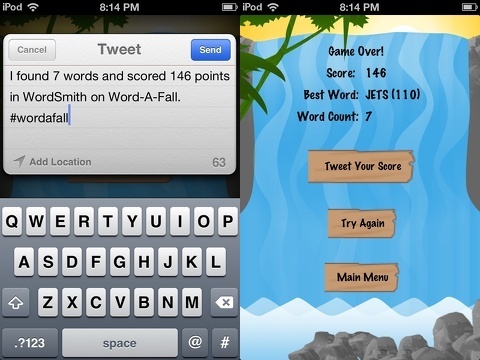 The Word-A-Fall iPhone and iPod Touch app is smart, fun, challenging, and refreshing. This would be a great game to incorporate a slower speed for kids, as it would be a fun way to elevate spelling and reading skills. It’s reasonably priced at $.99, and it’s a must for word game fanatics. AppSafari review of Word-A-Fall was written by Jenni Ward on March 11th, 2013 and categorized under App Store, Games, Strategy, Word Games. Page viewed 3644 times, 1 so far today. Need help on using these apps? Please read the Help Page.